While jamming at the popular Rae Town dance in 1987, Home T member Mikie Bennett said he was struck by an infectious new rhythm. "I found out that it was called the Cats Paw and it was done by Steely and Clevie at Jammys (producer Lloyd James)," Bennett told The Sunday Gleaner. "At the time Home T were looking for something different, and we decided to go to Jammys." James' Waterhouse studio was a hub for keyboardist Wycliffe 'Steely' Johnson and drummer Cleveland 'Clevie' Browne. 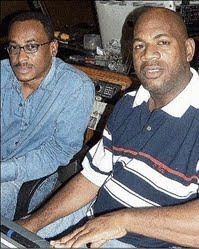 During the 1980s and 1990s, the duo created numerous hit jams there and were recognised as the hottest producers in Jamaica. Johnson died last Tuesday morning at a New York City hospital. Browne told The Sunday Gleaner that his friend of over 35 years had been diagnosed with kidney failure in December in New York; that visit also revealed a clot on his brain. Although he had recovered satisfactorily from surgery, Browne said Johnson had recently experienced multiple organ failure. On Tuesday, he suffered a fatal heart attack. The jocular Johnson wasted little time in his 47 years. He played on countless sessions, starting in the mid-1970s with producer Augustus Pablo, then with the Roots Radics band before gaining international fame with Browne. Steely and Clevie were responsible for some of dancehall's most memorable tracks. Many of them, like Wicked Inna Bed, Twice My Age and Trailer Load A Gal, were done by controversial deejay Shabba Ranks who led an invasion of dancehall acts on North American charts during the 1990s. Bennett said Johnson was in his element in the recording studio. "Steely was an Alpha male, he was the dominant force in most sessions," said Bennett. "Some people said he had a big ego, but if he heard something different and it was right for the song, he was the first to embrace it. That's what I respected most about him," he added. In the late 1980s and 1990s, Steely and Clevie's productions were rarely off the charts. Browne said they first played together on a session for Pablo in 1974, and played on Bob Marley and the Wailers' Trench Town and Stiff Necked Fools from the singer's Confrontation album. Johnson moved on to Roots Radics which backed singer Gregory Isaacs on hits like Night Nurse and Tune In. Browne became a member of the In Crowd band. When the sensational computer-driven Sleng Teng beat exploded in 1984, Browne said he and Johnson were among a handful of musicians who did not oppose the new concept. "We shared a similar vision that this was the future of reggae music," Browne said. That vision first bore fruit in singer Nitty Gritty's Sweet Reggae Music, which was a hit in Britain in 1985. Jammys' studio, home to a growing stable that included singers Cocoa Tea and Admiral Tibet and engineer Bobby 'Digital' Dixon, was the perfect place for Steely and Clevie's new sound. The team produced hits by Freddie McGregor (Prophecy, Loving Pauper), It's All Over (Buju Banton), Love Is The Answer (Garnet Silk) and Nyah Man Chant, the 1997 debut album by a roots singer from St Thomas named Bushman. Even as they worked with reggae's new wave, Steely and Clevie never lost their love for the music's roots. Johnson was a musicologist who spoke of his admiration for pioneer producer Clement 'Coxson' Dodd and musicians like keyboardist Jackie Mittoo. In 1992, the duo produced a tribute album to Dodd's Studio One label. It included Dawn Penn's No, No, No, which was an international hit for Atlantic Records two years later. Ten years later, they produced another tribute set, this time to producer Joe Gibbs. That also yielded a hit song, Sean Paul and Sasha's I'm Still in Love, which entered Billboard's pop chart. Browne says Johnson's admiration for early Jamaican popular music always guided him. "I was always impressed by his memory; he had a photographic memory. That was his greatest asset as a musician and producer," he said. Johnson is survived by his parents, eleven brothers and sisters and five children. The thanksgiving service for his life takes place on September 12 at the Swallowfield Chapel in St Andrew.